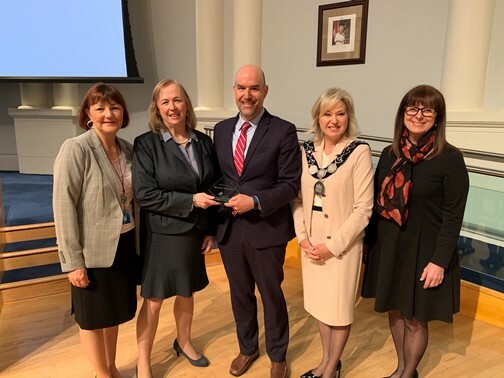 Today at Council, Mississauga City Solicitor, Mary Ellen Bench was honoured by the Canadian Corporate Counsel Association (CCCA) with its Professional Contribution Award. The award recognizes an individual or group who raises the profile of the CCCA in the professional community. The award was presented by CCCA Chair, Daniel Bourque and Executive Director, Alexandra Chyczij. To learn more about the Canadian Corporate Counsel Association and the Professional Contribution Award, visit www.ccca-accje.org. Bench was one of the first lawyers in Canada to be certified by the Law Society of Upper Canada as a specialist in Municipal Law. In 2008, she received the designation of Local Government Fellows from the International Municipal Lawyers Association (IMLA). In 2012, she received the IMLA’s Bruce A. Noble Award. In 2015, she received the Ontario Bar Association’s (OBA) Tom Marshall Award of Excellence for Public Sector Lawyers. In 2016, she was presented with the Osgoode Hall Law School Gold Key Award in the Public Sector category and was named President of the International Municipal Lawyers Association (IMLA).